I like to keep our dog food in the kitchen, just like the human food. 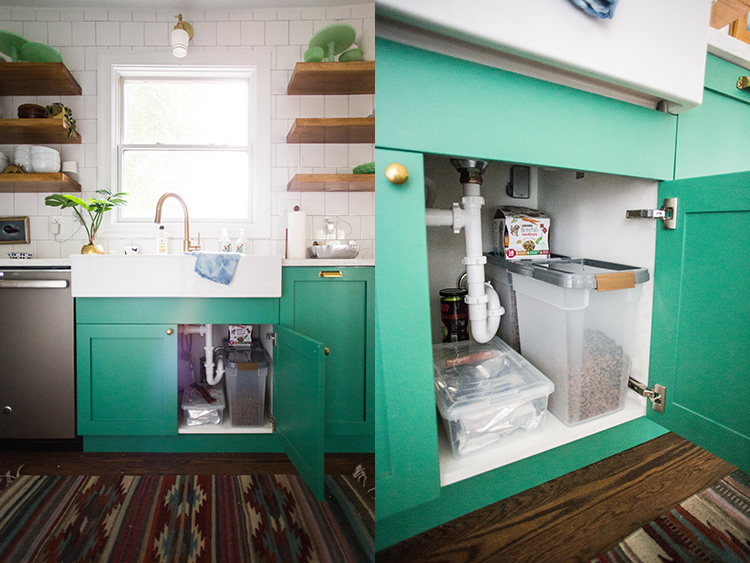 Our new house is smaller than the last, and I made space beneath the sink for a couple of narrow airtight dog food containers. It is so nice to have them right on hand at feeding time in the morning and evening. 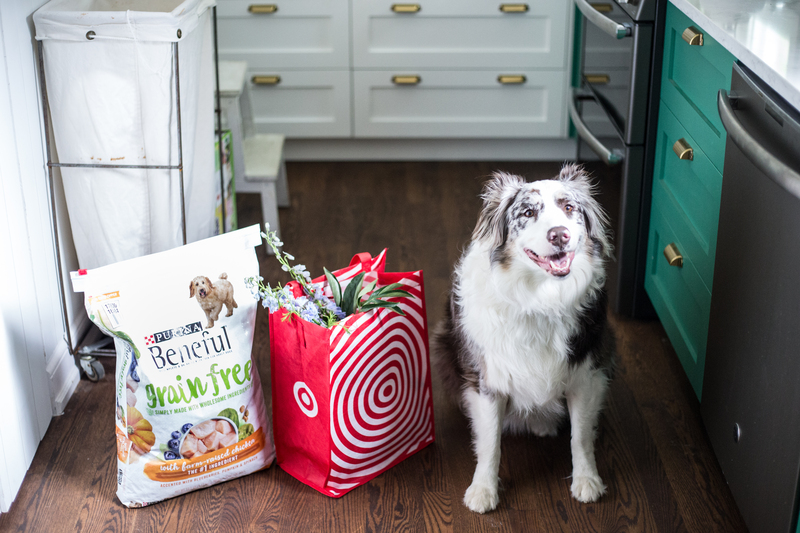 Quincy is just over two years old, and we recently transitioned her from puppy food to Purina® Beneful® Dog Food for adult dogs. We knew she was ready when she started looking like her puppy food intake was more calories than she needed, and the vet confirmed she was old enough for adult food. Then, it was as simple as replacing a little of the new food in with her puppy food for a week or so until the switch was complete! 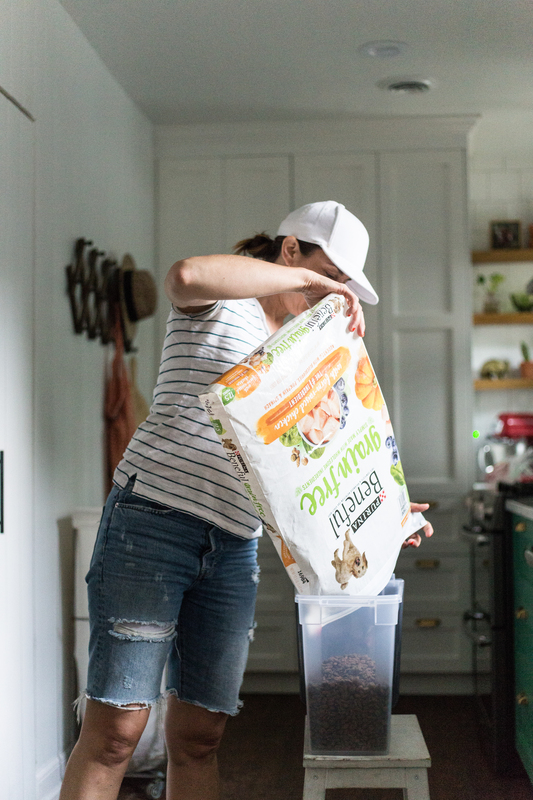 Purina actually has a step-by-step guide to transitioning your dog’s food plan. Check it out here. 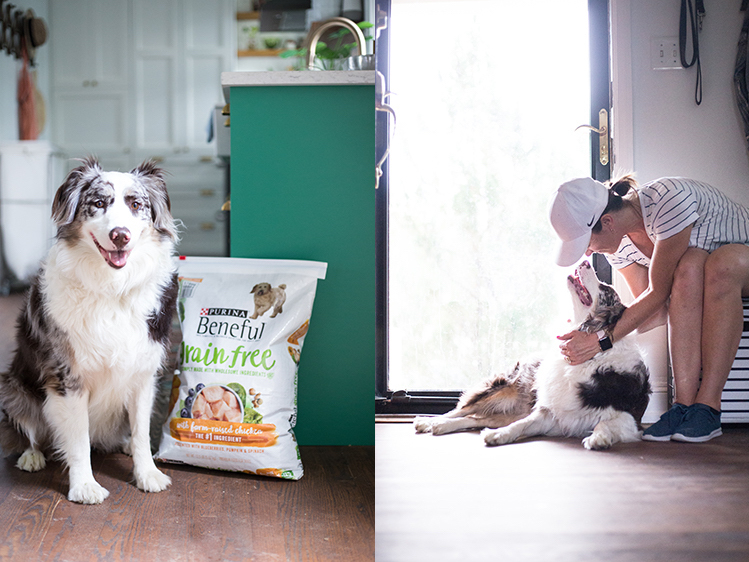 She is energetic and active, and I love feeding her this simple recipe dog food with no fillers, wholesome ingredients that don’t include corn or wheat, and that has farm raised chicken as the #1 ingredient. I care about how things look in my house, and spend a lot of time and energy on organization and design. I want Quincy’s dog bowl to look intentional rather than looking like an afterthought, as dog bowls sometimes do. She loves to eat when we are eating, and by keeping her bowl in the kitchen, we can encourage her to eat her own healthy dog food rather than begging at the table for our leftovers. 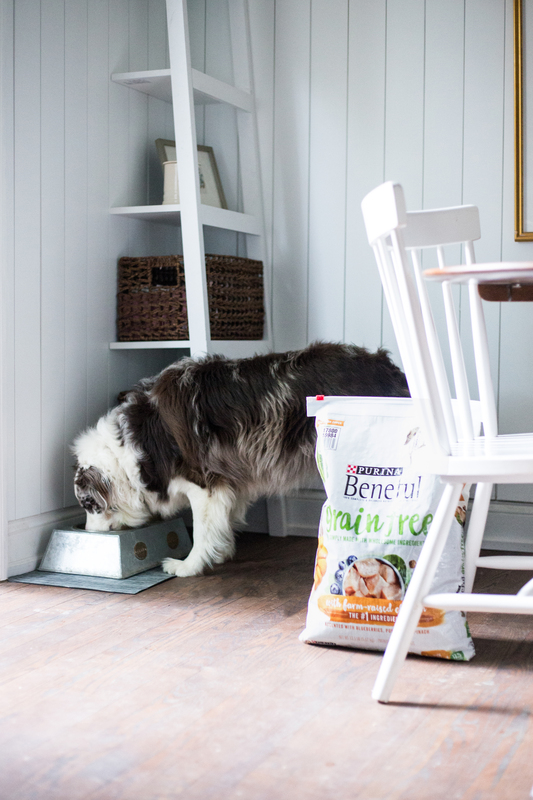 I know she is getting the nutrition she needs from her Purina Beneful Grain Free food, and we are working on teaching the kids to stop tossing her their last couple bites. 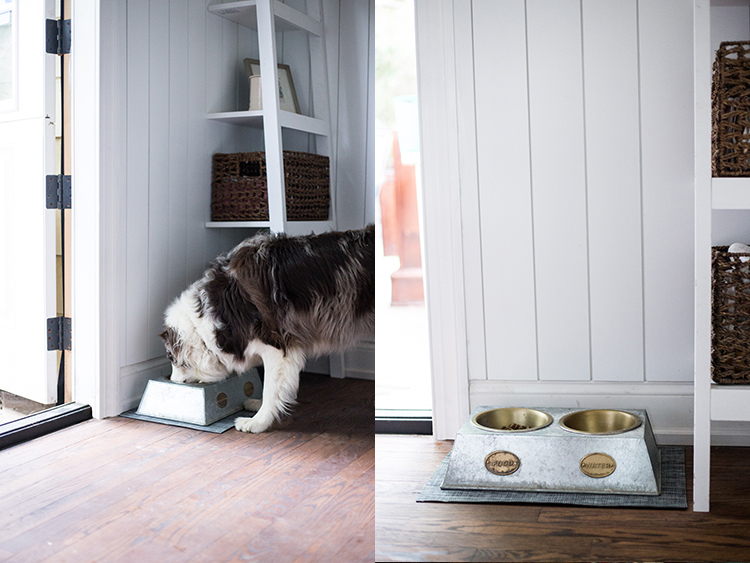 It makes sense for her bowl to be near the back door (and future exterior dog door) so she can head outside after a meal or go straight to her bowl for water after playtime. I set it up on a nice looking spill-proof mat that I spotted in the pet aisle at Target. I bought her raised metal bowls when she was a puppy, and I noticed some similar, very pretty ones also at Target. Organizing items by type and function sounds obvious, however sometimes we forget to be thoughtful about where we put things. Right inside our front door, I have a drop zone for shoes, coats, and backpacks. This is also the perfect place for Quincy’s walking supplies and toys. Anything you are going to grab on your way out the door should have a place near the door! I like to keep her leash hung on a hook and stash some tennis balls and toys in a cubby above it. I also keep a basket with her grooming tools and other chew toys here, so it is all stored together in a sort of dog supply area. Quincy adds so much fun, companionship, and entertainment to our family, I want her supplies to be intentionally and thoughtfully organized in our home. By taking some time to think through what she needs and how I can make a place for everything, our day-to-day routine with her is simple and happy. 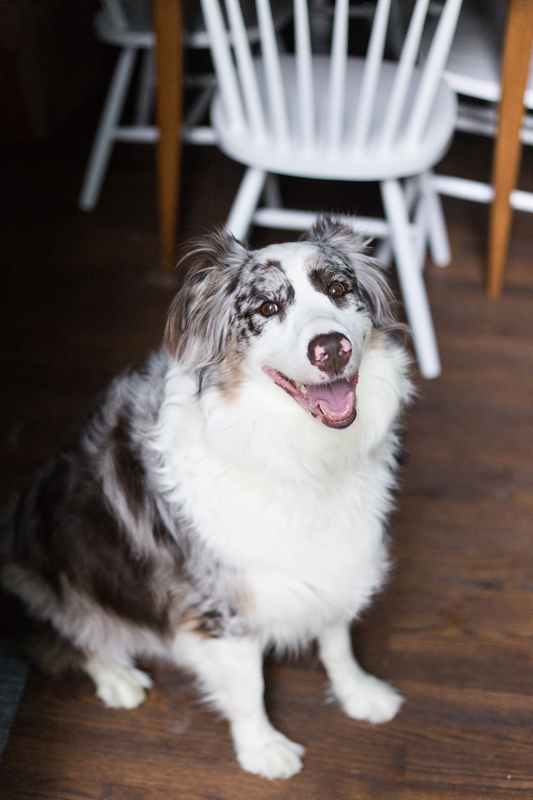 I hope you got some ideas for how you can organize your pet supplies at home! 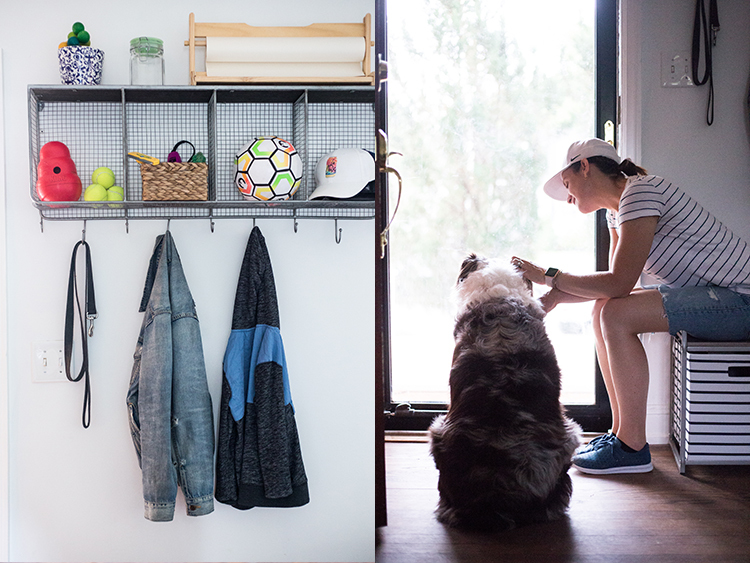 If you have any other great tips or pet organization hacks, feel free to leave them in the comments! I’d love to hear.